Eltima is a software developer for Windows and Mac related applications. They are in business for 15 years and provide smaller but useful utilities. SyncMate and Folx are some fine examples of their applications. Their last marketed application is called CloudMounter ( version 3.0 ) which is a neat and practical utility which we will discuss in this review. CloudMounter is an application for macOS developed by Eltima Software, released on July 12, 2016.It has both standaloneand Mac App Storeeditions, with several technical differences between the two. Installing CloudMounter is simple and easy. Straightforward drag & drop in your applications folder and you’re set. – “Shared with me” Google docs can be managed in Finder. Most Mac and Windows users will have one or more accounts on Google Drive and Dropbox, and any Cloud storage-server. Nowadays many users also have their own website which makes FTP client connections with CloudMounter a welcome feature. For all of us running multiple Cloud accounts, CloudMounter can make your external account behave like a local drive, which is great for easy access and file-control. CloudMounter 3.0 supports a variety of connection options. 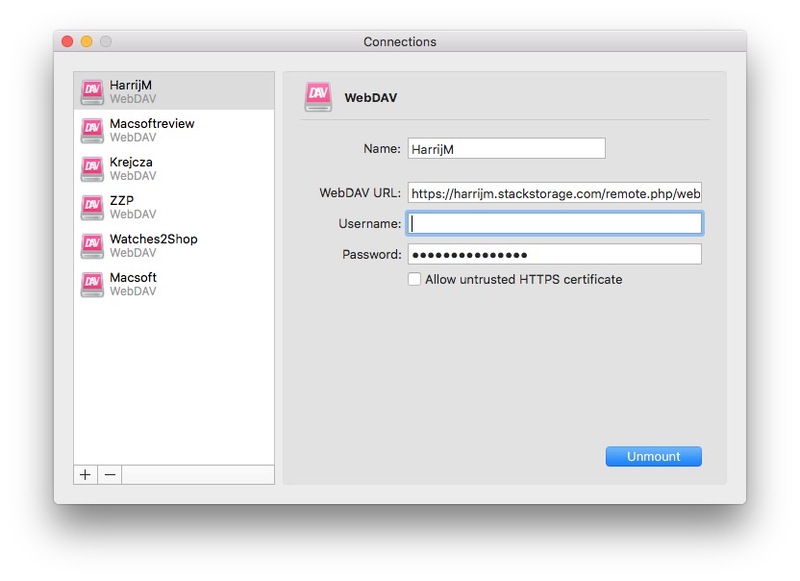 The main window of the app is a connections manager, where each supported service is assigned to a button.To mount a required drive, a user chooses the corresponding service, enters login credentials and adds a new connection to the list. Clicking “Mount” will display the new drive in Mac Finder. When verification has passed, a drive icon is placed on your desktop. You now can use the account as if it was a local disk, really great ! This is where CloudMounter excels providing you ( virtual ) local harddisks for each and every cloud connection. No more web file handling/transfers, now you can transfer or open files like a normal harddisk. There is a little delay of course if you are transferring data over your wifi or home/business network to the cloud. It will sync with your OSX system at system logon. It really works well, considering you’re dealing with a Virtual harddisk. Your private internet connection speed will probably have influence on your experience in behavior, but so does your private Google Drive on the web file handling. Interface has a nice and clean layout. CloudMounter 3.0 has nearly every type of online storage covered and connections are as stated simple to setup. For those using or trying to use WebDAV connections, make sure your path is set in the correct way. Most external WebDAV connections need an extra addition to your normal path, in my case; remote.php/webdav/ check your provider for information if you run into problems. Preferences are like earlier versions minimum. The first two options are set default for anyone I guess, and the third/fourth are optional for the user. You may want to use Encryption to keep your files safe and private. Your cloud and remote server files are absolutely protected with CloudMounter encryption functionality. You can tune the data encryption and secure remote servers and cloud accounts, so that they can only be accessed from your instance of CloudMounter. The encryption works that way that if someone somehow obtains the access to your storages from a different device, they will only see a confusing non-sense. CloudMounter integrates in your Finder which makes it part of your local file-system. Handling files is now managed in the best way possible. 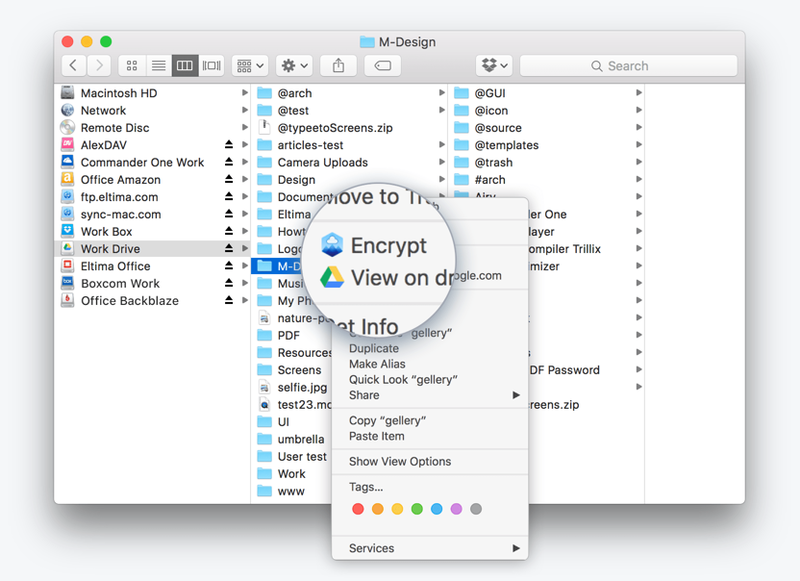 Encryption is part of the Finders-menu and animated icons inform you about the file-status. Unlike native clients of the storage services, CloudMounter does not perform synchronization and thus does not occupy hard drive space on Mac. The files are downloaded only when the user opens them.The software allows adding any number of supported cloud accounts. CloudMounter does not store login credentials of the added connections. Passwords are kept in macOSKeychain. They are sent directly to the servers only when required. Logging into the cloud accounts is performed through their standard APIs. CloudMounter is NOT the only application available of course. There is some stiff competition like Expandrive and Mountain Duck. After testing I can assure CloudMounter beats Expandrive in every aspect. Stability of an application is essential and Expandrive fails short . Mountain Duck has little more connection options available like Authentication. CloudMounter 3.0 impressed with solid and stable performance ! – Free version supports only for one Dropbox, Google Drive and OneDrive accounts with encryption. 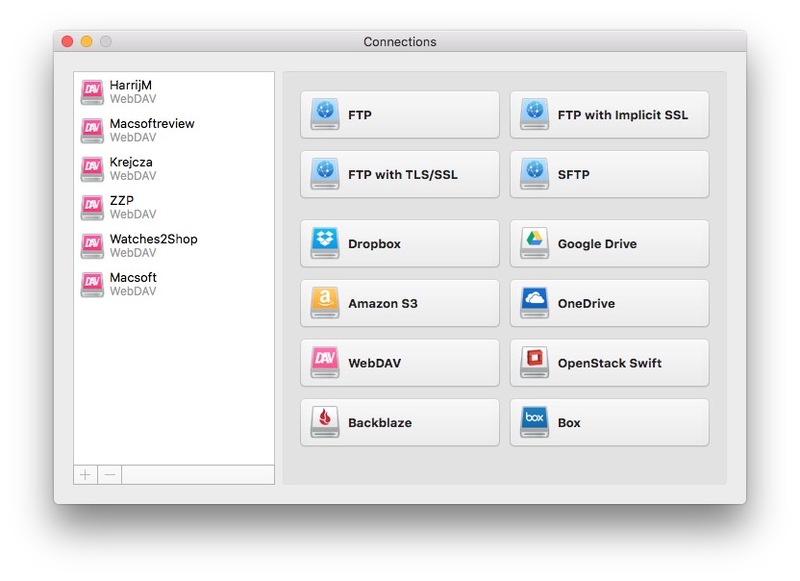 – Paid version supports multiple connections of these services with encryption and additionally Amazon S3 and S3-compatible storages, FTP/SFTP/WebDAV services, OpenStack Swift, Box cloud and Backblaze B2. Our verdict of CloudMounter 3 is easy to explain. Eltima launched an outstanding application ! Its easy to configure and options are plenty. Most external cloud-based servers are available and encryption is present for those wanting to safeguard their Files and Data. The Finder integration makes it behave as a local drive which makes its usability effortless. I can recommend CloudMounter 3 fully as its a useful utility for everybody having multiple cloud accounts.